Tesla's Supercharger network isn't just for Californians any more. The first Supercharger location outside California has been spotted in Milford Connecticut, and was officially opened on Friday. Interested folk can track progress of the Supercharger network via the ReCargo app for smart phones, or on the Tesla website. The new Supercharger station location is perfect for Model S owners in either the Boston or New York areas who wish to drive between those two cities. The location is on I-95, near New Haven and near the intersection of I-91 and I-95. In actuality it is two Supercharger stations, at both the northbound and southbound Milford service plaza's, between exits 40 and 41, located next to the McDonalds in each plaza. This location is convenient not only for the Boston-New York corridor, but also those going into central Connecticut or Massachusetts. Tesla's website shows another station at the Delaware Welcome Center and Travel Plaza, between exits 1 and 3 on the Delaware Turnpike. Members of the teslamotorsclub.com forum have posted pictures showing four charging stations, and that are being installed near the gasoline pumps. 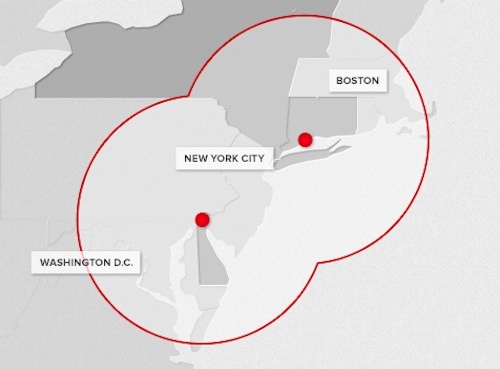 Tesla's website shows these two locations as providing a pair of bubbles that begin to cover the Washington DC to Boston corridor. The distance between these stations (199 miles) places them further apart than in California, leading one to think the company will build other Supercharger stations along this corridor and further south along I-95. A Model S owner living in this region can, today, use either of these stations for a fast charge while on the road. It may occur to someone that a traveler driving to Washington DC could charge fully at the Delaware Welcome Center, and arrive in Washington with insufficient range to make it back to the Supercharger station in Delaware. Rather than being stuck by the side of the road with a dead Tesla, that Model S owner could very easily use J1772 charging stations in Washington DC to snag a charge there. Additionally Tesla Motors is likely to be installing more Supercharger stations along this corridor, closer to Washington DC, and in central New Jersey. The 199 mile distance between the stations would require a 60 kilowatt-hour Model S owner to almost completely deplete the battery pack which is undesirable for battery pack longevity. That makes additional Supercharger stations an almost certainty. The Model S has a high power flexible charging system that can connect to nearly any kind of power outlet from 120 volt outlets, to J1772 charging stations, and even the 240 volt 50 amp NEMA 14-50 outlets common at RV parks. Details of the Supercharger network were unveiled in September 2012, along with the first six stations. At that time the goal was to expand the network in California to have more stations along I5 all the way to the Oregon border. Neither the Recargo app, nor the Tesla website, show any such expansion has yet occurred. The 85 kilowatt-hour Model S has an EPA certified range of 265 miles, while the 60 kilowatt-hour Model S has a 208 mile range. Both versions of the Model S can be be outfitted with Supercharger support. With the Supercharger station a Model S can gain 150 miles of range in 30 minutes of charging, which is close to 20 times the charging rate of typical normal electric cars at typical J1772 charging stations. The Model S is the first electric car which can properly implement a Road Trip. I'm not certain, but I would imagine the Tesla dealership in Washington DC, the five in the New York City area, and the one outside of Boston could be used for some quick charging. This would close the gaps considerably.